Judge me, O God, and distinguish my cause from the nation that is not holy: deliver me from the unjust and deceitful man. For Thou art my God and my strength. Ps. 42, 3. Send forth Thy light and Thy truth: they have conducted me, and brought me unto Thy holy hill, and into Thy tabernacles. Judge me. Look with favor upon Thy household, we beseech Thee, O almighty God, that, by Thy gift, it may be governed in body and, by Thy preservation, may be guarded in spirit. Through our Lord. Brethren, Christ, being come an high priest of the good things to come, by a greater and more perfect tabernacle not made with hand, that is, not of this creation: Neither by the blood of goats, or of calves, but by his own blood, entered once into the holies, having obtained eternal redemption. For if the blood of goats and of oxen, and the ashes of an heifer being sprinkled, sanctify such as are defiled, to the cleansing of the flesh: How much more shall the blood of Christ, who by the Holy Ghost offered himself unspotted unto God, cleanse our conscience from dead works, to serve the living God? And therefore he is the mediator of the new testament: that by means of his death, for the redemption of those transgressions, which were under the former testament, they that are called may receive the promise of eternal inheritance; in Christ Jesus our Lord. Deliver me from my enemies, O Lord, teach me to do Thy will. Ps. 17, 48, 49. My deliverer, O Lord, from the angry nations: Thou wilt left me up above them that rise up against me: from the unjust man Thou wilt deliver me. Often have they fought against me from my youth. Let Israel now say: often have thy fought against me from my youth. But they could not prevail over me: the wicked have wrought upon my back. They have lengthened their iniquities: the Lord Who is just will cut the necks of sinners. At that time, Jesus said to the multitudes of the Jews, Which of you shall convince me of sin? If I say the truth to you, why do you not believe me? He that is of God, heareth the words of God. Therefore you hear them not, because you are not of God. The Jews therefore answered, and said to him: Do not we say well that thou art a Samaritan, and hast a devil? Jesus answered: I have not a devil: but I honour my Father, and you have dishonoured me. But I seek not my own glory: there is one that seeketh and judgeth. Abraham your father rejoiced that he might see my day: he saw it, and was glad. The Jews therefore said to him: Thou art not yet fifty years old, and hast thou seen Abraham? Jesus said to them: Amen, amen I say to you, before Abraham was made, I am. They took up stones therefore to cast at him. But Jesus hid himself, and went out of the temple. I will confess to Thee, O Lord, with my whole heart: render to They servant: I shall live and keep Thy words: enliven me according to Thy word, O Lord. 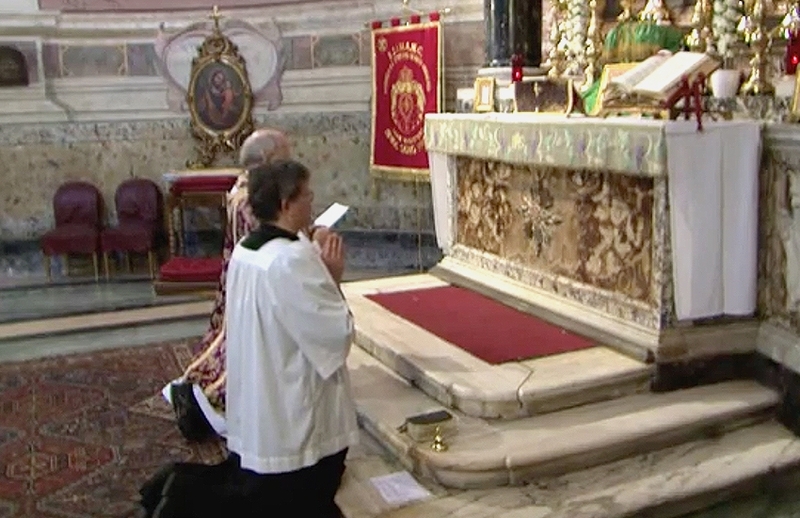 May these offerings, we pray Thee, O Lord, both loose the bonds of our sins, and win for us the gifts of Thy mercy. Through our Lord. Draw near to us, O Lord, our God, and with Thy perpetual succor defend those whom Thou hast refreshed with Thy mysteries. Through our Lord.